Tonight at the monthly knitting meetup, I hope to get some ideas on how to knit this self striping yarn into socks. I weighed the skein and it was 4 grams short of the 100 grams on the label. So each ball is only 48 grams. One good thing was that the split came pretty close to the start of the striping pattern of the first ball. I think I should make a toe up type and then knit until the end of the skeins. I am hoping my friend Marsha can give me some pointers. 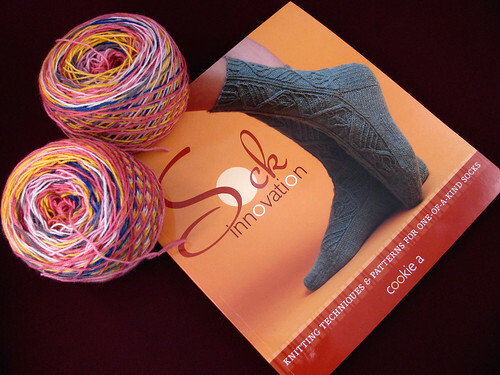 Marsha knits the most fabulous sock patterns including some of Cookie A’s. When I saw this book about the design process by the famous sock designer I had to have it. Now I need to choose a pattern and see if it can be knit toe up. It will be a challenge. The last pair of socks I knit were for my son, more than 10 years ago. I used worsted weight yarn that was left over from a matching sweater. The yarn was so thick it hurt his feet to walk on the stitches. Hopefully these will be wearable. This entry was posted on Wednesday, April 8th, 2009 at 3:00 am and is filed under Knitting. Tagged: Knitting. You can feed this entry. You can leave a response, or trackback from your own site. I’ve heard such good things about that book! Looking forward to seeing your sock progression! Can’t wait to see what you do with your lovely talent!